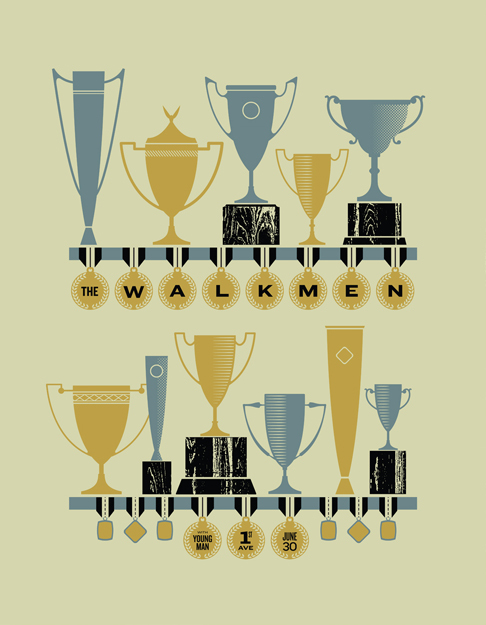 I designed a gig poster for The Walkmen for their show at First Ave in MPLS last month. The design was inspired by their new great album, “Heaven”. The poster is a three color (metallic gold, gray/blue and black) 18 x 24 screen print on heavyweight light green stock (French Construction Cement Green). Prints can be purchased at the paypal buton above or through my etsy shop. I’m working on a few detail shots of the poster that should be posted in the next week or so. Thanks to the band and their management for the opportunity to work on this project.